The WPF Commands are really a cool and powerful tool that really help when you are trying to separate concerns by using patterns such as M-V-VM. If you haven’t had a look at my previous post on the ICommand I suggest that you do that before reading this post. The only thing that I see a bit limited is the fact that you can use Commands only when a control implements the ICommandSource (such as ButtonBase etc). Well to say the truth you can still use commands if a Control does not implement ICommandSource but you have to do some plumbing yourself. Another problem that I see is that when a control implements the ICommandSource you are bound to the fact that the command will get executed according to the event being hooked up in the control implementation of ICommandSource, for example in case of a Button the Command would be executed when the Click event is raised. But what if you don’t want to execute a command when the Click event is fired, what if you want a command to be fired when the MouseRightButtonDown… One of my favorite WPF gurus, John Gossman blogged on this, read his post here. I really love this approach yet you have to create an AttachedProperty for every different event you want to hook to. It would be nice if you could supply the name of an Event in an AttachedProperty and the rest is done for you, i.e calling the Command when the event is fired… something like this…. 3. You can Databind the Command, the CommandParameter and also the Event which will execute your Command (This is shown in the demo by binding the event to a combobox populated with event names. This solution would not only let the ViewModel control what is shown in the View but also control the Behavior of the UI if needed. With this the ViewModel now has the power to control also the behavior of the the UI ! 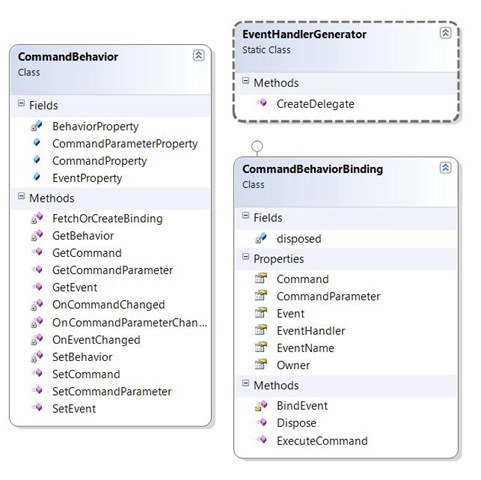 Defines the Attached properties to be used on a control that need to hook an event to a Command. This is an attached property that stores the Event name (as a string) for the Event you want to hook. Static class that is able to create a method at runtime that has the same signature as the EventHandlerType of the Event so that we can register to any kind of event. PLEASE NOTE: This uses Reflection and also DynamicMethod which construct the IL for the event handler at runtime! The code is very simple. All we are doing here is to create an event handler at runtime that has the same signature as the Event type. The EventHandler that we create on runtime calls a method of the CommandBehaviorBinding that executes the Command. By using reflection we get the EventInfo of the EventName set in the Attached property and hook the EventHandler we created at runtime to the Event. That’s basically it. I think the best thing to do here is to have a look at the source code I provided in this post and see how it all works out. 1: <Border Background="Aqua" Width="300" Margin="0,0,10,0" Height="25"
2:     <Border Background="Aqua" Width="300" Margin="0,0,10,0" Height="25"
– You can only hook to Events that have a Delegate of type void (for example EventHandler). I did this by design not to over complicate the generation of the dynmaic EventHandler + because most events for controls are all void. 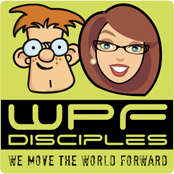 This entry was posted in tips and tricks, WPF. Bookmark the permalink. Marlon – this is fantastic stuff. The code could help me solve an issue I had a while ago trying to hook up a generic undo framework. It was limited by the lack of Command capability, so I’ll have a play around and see if I can get it up and running now. The EventHandlerGenerator class is pretty nuts matey, where the heck did you think that one up from. Hey did you use this source http://blogs.msdn.com/joelpob/archive/2005/07/01/434728.aspx for the EventHandlerGenerator idea. Looks simliar. Neat anyway, well done you. I wrote in my blog about triggering commands in other event (http://www.japf.fr/?p=22) but your approach generalizes the principle in a very nice way. Thank you for your work ! Coincidentally, someone just mentioned on the WPF Toolkit forum that they would like to execute a command on a DataGrid mouse click event. I pointed them in your direction! Really nice work. I really like this implementation. But it seems like there is no way to pass EventArgs to the command’s execute method. The only contextual data we can pass in is CommandParameter, which could be limiting for some scenerios. Thanks a lot for the excellent work. I came here to make the same comment… I need to check the Handled property on a MouseDoubleClick event that fires an attached command. This impplementation has saved me some headaches, but now I’ve got a problem. Does someone know how to do it? I’m taking a look at EventHandlerGenerator.CreateDelegate but so much IL code is making my head spin. The change in IL is an option that I would not recommend because as such you don’t want the ViewModel to do this. And how would I do that with an attached property? I don’t have access to the EventArgs of an event on the ViewModel, and I don’t really want to, that would break any design. Actually, it makes sense to mark the event as handled once it executes a command, don’t you think so? I’ve solved my problem with an “old school” approach – subscribing to a ListBox MouseDoubleClick event and getting the ListBoxItem that fired the event from e.OriginalSource, from there I can execute the command in its ViewModel object, and of course I can mark the event as handled. Not an elegant solution, mind you, but it works. Don’t take me wrong, I love what you’ve done here, that’s why I try to use this approach as much as possible! :D.
The attached property would do exactly what you are doing in code behind but in a more generic manner so that you can re use it. Unless… of course! I could globally subscribe to ListBoxItem.MouseDoubleClick, check if the ListBoxItem has an attached property (which would be a command in my case) and in case it has it, mark the event as handled and execute the command. Was that your idea? I like it very much, finally a good way to bind my view to my ViewModel. Since it was handy in my project I added the capability to fire routed events also. I have been attempting to attach a behavior to an expander such that when the control Expands (user clicks on the Expander Header) I can check to see if the user has logged on in the OnExpanderExpandedCommand. The problem that I am having is the expander header will expand and collapse but will not fire the MouseDown event event whit a wrapping border. If I click somewhere in the expander besides the header, the event fires and the command works. Do you have any suggestions on working with the expander? Nice work, but I was having problems. This appears to fix the issue, but am I doing something else wrong? Five years on and I’m finding myself applying the same fix you’ve suggested here Chris. Has it worked out for you in the long run or did you encounter problems in production? Btw is there an open source repository anywhere? I got the code out of a zip linked to from the original post. The inability to set the event handled flag to true severely limits the usefulness of this implementation. All sorts of problems appear higher up in the visual tree, for instance, if a ListBox is located in a TabItem, ListBox SelectionChanged events bubble up to the TabControl and fire SelectionChanged on the TabControl. AFAICT, there is no way to easily fix this. It’s a shame because if not for this problem, AttachedCommandBehavior would be great. Hey! Great article, thank you. I have a question about the attachedcommandbehavior in combination with contextmenus on a treeview. I have two contextmenus – one on the treeview itself and one on the treeviewitems. In both contextmenus I have a menuitem on which the same command is attached (for the click-event). When executing the command on the treeview itself, the command in the viewmodel behind gets “called” and everything’s fine. When executing the command on the treeviewitems the command in the viewmodel doesn’t get “called” and so the CommandBevahiorBinding.ExecuteCommand() method throws an exception, because the “Command”-Property is null there. Hey one question. Is there a way to define if the event raised is marked as handled or allowed to continue bubbling? My scenario is that I have an expander with a double click handler on it. Then inside that expander I have something else with a double click handler on it. The interior item’s double click bubbles up to the expanders so I get the behavior of both double clicks. I keep hearing about how wonderfull wpf is in regards to binding and then i see the hundreds of posts of people who like myself trying figure out how to bind events, commands etc. Your code is more clever than anything i could ever write but i think it is a great indictment of MVVM and WPF that it required 4 classes and 300 lines of code so that you can wire up an event that takes one line when using code behind. 300 vs 1 means 300 times more chance of errors and mistakes to creep in just so that some theoretical model is maintained. If the MVVM should be used with WPF then none of this additional code should be required, it should already be there built in and ready to use. complexity adds confusion and oppertunity for errors. The fewer parts the more beautifull the solution. Why when I’m trying to attach a behavior to a Lisviewitem (at the style) am I getting an Error 6 Cannot resolve the Style Property ‘Event’. Verify that the owning type is the Style’s TargetType, or use Class.Property syntax to specify the Property ? Awesome, this saves me a lot of time. Thanks, Marlon. You really rocks. Here once you binded the e.NewValue, it won’t change, but actually every time the command is invoked, the binding value may change. mobilen Banking neue Maßstäbe setzen.